eCigs HQ: SmokeTip Flavor of the Month: December! Home » e-Cigarette Special Offers » SmokeTip Flavor of the Month: December! SmokeTip Flavor of the Month: December! Offer good thru December 2012 and subject to availability. SmokeTip Flavor of the Month! In an effort to give their customers an opportunity to try a variety of different flavors, SmokeTip is continuing their Flavor of the Month Program. At the beginning of each month, SmokeTip is offering a new and unique flavor not currently available on their website. They try to have enough stock to last for the month, but there are no guarantees — make sure to buy early if the flavor interests you. 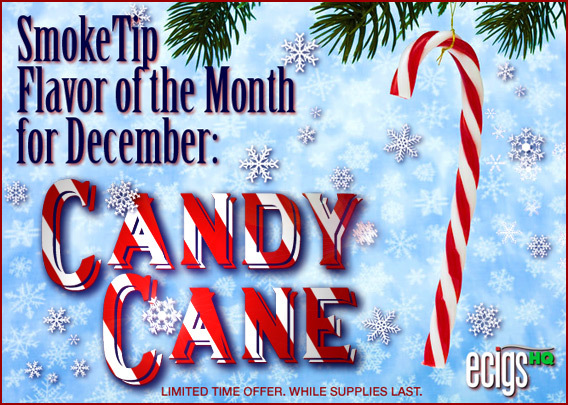 Right in time for the holidays, the SmokeTip Flavor of the Month for December is Candy Cane! The crisp and cool taste of Peppermint to make your holiday season brighter! The new Candy Cane flavor will only be available during December and only while supplies last. To take advantage of the Flavor of the Month today, visit the SmokeTip website by clicking the banner above or the link below to receive one FREE Starter Kit with every Starter Kit order. Order Three 10-Packs of your favorite SmokeTip Cartridges and get 1 FREE Battery! This is the best free battery offer in the industry. If your SmokeTip battery should ever stop working, you get a FREE replacement battery sent out with your next cartridge order — for life! See site for complete details. Click on the link below and then type ecigshq into the box marked Redeem Coupon and you will receive a 10% discount on your SmokeTip Starter Kit purchase. This coupon code offer may be withdrawn without notice — so please place your order promptly. ALL SMOKETIP OFFERS SUBJECT TO CHANGE/WITHDRAWAL AT ANY TIME WITHOUT PRIOR NOTICE. Reviewed by Admin in e-Cigarette Special Offers | Comments Off on SmokeTip Flavor of the Month: December!